A rare high-value Hotels.com coupon code, valid for travel until 27 August 2014. Minimum 300$ purchase. The prestigious Qatar Airways (a 5-star Skytrax airline) offers several discount codes valid for departures from various locations worldwide. 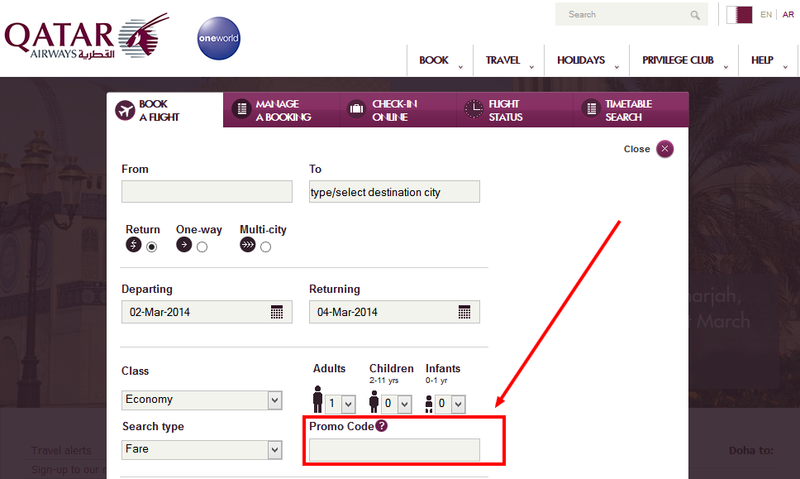 We will keep this post updated with the latest Qatar Airways voucher codes, as they will be introduced by the airline. Valid for flights to Bangkok, Bali, Katmandou, Maldives, Ho Chi Minh, Kuala Lumpur, Phuket, Colombo, Dar es Salaam, Phnom Penh, Jakarta, Muscat, Perth, Singapore, Delhi, Chongqing, Chengdu, Hangzhou, Dubai, Sharjah, Clark, Doha. Valid for flights to Bangkok, Bali, Singapore, Colombo, Kuala Lumpur, Hong Kong, Jakarta, Melbourne und Kathemandu. The price will be automatically discounted, no need for further action. Kyriad hotels is a chain of modern affordable hotels located all throughout France. They currently offer a 10€ promo code KYTDFR201301 when bookings flexible rates directly on their website. The Kyriad voucher code above returns a 10€ from the flexible rate, meaning that you can always change / cancel your reservation if plans change. Just select that rate and continue with the booking process, as usual. As all of the large international hotel chains, Best Western also offers a Best Rate Guarantee. This means that when you book directly through Best Western´s website and then, within 24 hours you find a cheaper rate elsewhere, Best Western will give you the room at the cheaper rate found and, in addition, will also send you a 100$ travel card. The Travel Card will be sent by Best Western after your stay and can be used when settling your bill during your next stays at any Best Western property. This solution might not always work in all locations and all dates, as sometimes there are no cheaper rates elsewhere, but it is worth trying. - the cheaper price found elsewhere must be for the same hotel, dates, length of stay, same currency, number of guests and similar room type. Note the web address of the travel agency and the amount of cheaper rate found - the "Comparison rate" (also make a print-screen showing the cheaper rate). Do NOT make any reservation on that website, as the final purpose is to make a discounted reservation through the Best Western official website. A Best Western representative will contact you (usually within 48 hours) to inform you about the claim: whether it was approved, or if not, the reasons for dismissal. Here is where the print-screen (see step 2) might come in handy, in case of disagreement with the Best Western representative. - only one travel card er household per 30 day interval may be granted (this means that if you have two successful claims within a 30 days period, you will receive the 100$ card only for the first one). Leave a comment at the end of this article to share your experience in claiming the Best Western´s Low Rate Guaranteed. This is the listing of the Park, Sleep and Fly hotel packages at the Manchester International Airport (MAN), in the ascending orders of price (starting with the cheapest package), as we found them for a night's stay on the 3rd of May 2014. Travelocity Canada offers a 10% coupon code valid for bookings of minimum 100 Canadian Dollars (travel throughout 2014). 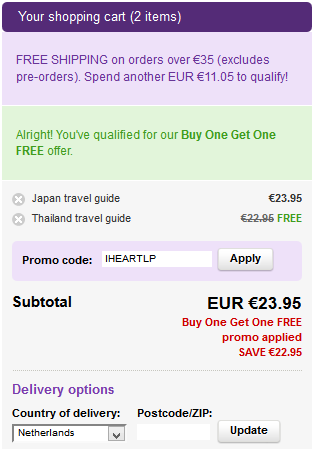 The voucher code must be typed in the box "I have a Hotel Promotional Code", just below the total price information, in the page "Review and continue" (which appears after you've made your room selection). This is the listing of the Park, Sleep and Fly hotel packages at the London Gatwick International Airport, in the ascending orders of price, as we found them for a night's stay on the 3rd of May 2014. One particularity as opposed to most European airports, none of the hotels around the Gatwick Airport offers free shuttle. Instead, one has to use the paid service of shuttle buses. NH Hotels is a chain of almost 400 quality hotels spread out mostly in Europe (but with strong presence in Spain, Italy, The Netherlands and Germany). They also have some properties in Latin America and Central America. This reputable hotel group is listed on the Madrid Stock Exchange. For stays until 31 March 2014, you get 40€ credit off the flexible rates. The credit will be posted into your loyalty account and you can use it when you settle the bill upon check-out. We have already booked a week-end night in March at the NH Bologna Villanova****, for which at check-out we will pay 35€, breakfast included (that is 75€ the room rate minus the 40€ credit). The same room would cost the full 75€ when using booking.com, for example. This is to be obtained using the Best Rate Guarantee of InterContinental Hotels (the group which includes the Holiday Inn brand). The value added of this post is that we found a website that usually provides lower rates for Holiday Inn Berlin City East. This website is called Grand City Hotels, which is a hotel management company, managing over 100 hotels in Germany, the Netherlands, Belgium, Austria, Cyprus and Spain. 1. Make a flexible reservation at Holiday Inn Berlin City East (click on the hotel name to make the booking). We underline the importance of making a refundable reservation on the Holiday Inn website, to avoid the risk that the Best Rate Guarantee does not work. 2. Check the rates on Grand City Hotels website, to make sure that they are lower than those from Holiday Inn website. Do not make any reservation with Grand City Hotels, only note down the rate, as you need it in step 3 below. You should get a reply from a Holiday Inn representative within maximum 3 business days. If the claim is not approved for any reason, you may very easily cancel the reservation (as in step 1 above you made a flexible reservation). For example, one night (8 March 2014) for a standard room, breakfast included, has a price of 125€ when booked directly on Holiday Inn Berlin City East website. 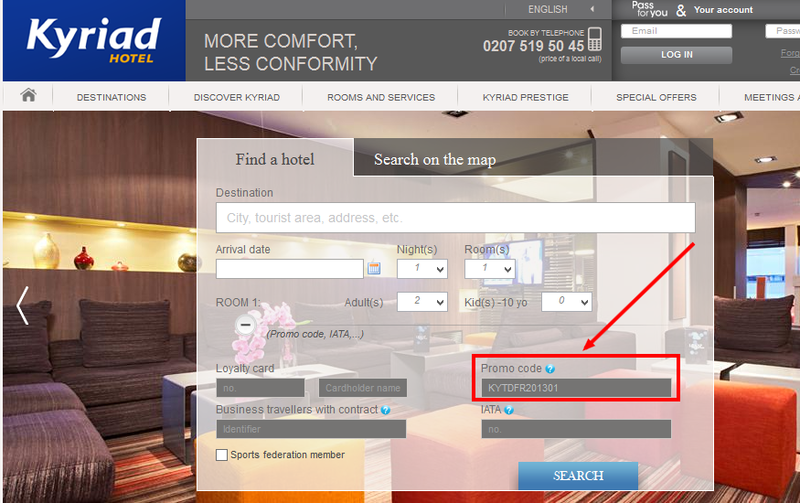 However, Grand City Hotels offers the exactly same room at 116€, allowing you to make the claim from step 3 above. They currently offer the third night free for all their hotels in Sweden, Denmark, Germany, Poland and Belgium. This special deal also includes breakfast. It is valid for booking until 15 August 2014, for stays between 20 June and 17 August 2014. The rates are non-refundable, so book only if you are sure of your travel dates. For example, 3 nights over the extended week-end 27 - 30 June 2014 at the Scandic Ariadne*** in Stockholm, Sweden, have a total price of 192€ (breakfast included). This gives an overall discount of more than 33% when compared to the 312€ charged by booking.com. We are listing the Park, Sleep and Fly hotel packages at the Heathrow International Airport, in the ascending orders of price, as we found them for a night's stay on the 5th of April 2014. One particularity as opposed to most European airports, none of the hotels around the Heathrow Airport offers free shuttle. Instead, one has to use the paid service of shuttle buses. Hotels4U.com (part of Thomas Cook group) has a £30 discount code on hotel reservations made until 6 June 2014 (for stays until 31 October 2014), with a minimum value of £300. The Priceline promo code is valid for stays anytime, for 2 stars and above hotels. For bookings between 10 February until 31 March 2014, Disneyland Paris offers discounted travel packages, including free half-board and free park tickets. The current "They Grow Up So Quickly!" promotion is valid for arrivals between 3 April 2014 and 31 August 2014, including school holidays. Thomas Cook discount code valid for holiday packages (£800 minimum spend). Travel needs to take place before 31 May 2014. A new Zleeping Hotels discount code for 20€, valid for bookings until 31 August 2014. The Zleeping Hotel promo code must be typed in the "Shopping cart" page, in the section "Campaign code", next to the total price information. The deal offers a 20% discount off the Best Available Rate at selected Radisson Blue hotels in Australia, China, India, Thailand, Philippines, Fiji and Bangladesh. This Radisson Blu special offer is valid for stays until 30 December 2014. Even better, these rates are flexible and can be cancelled free of charge until the check-in date. Do not forget to log into your Club Carlson account when booking, to earn loyalty points that you can then use for free nights (especially with the current 38 000 free points after 3 nights). Economy flights from US Airways, operated by American Airlines. This low price was available for the sample dates of 29 March 2014 (outbound) to 6 April 2014 (inbound). As with any glitches in the reservations systems, this deal might be very short lived.